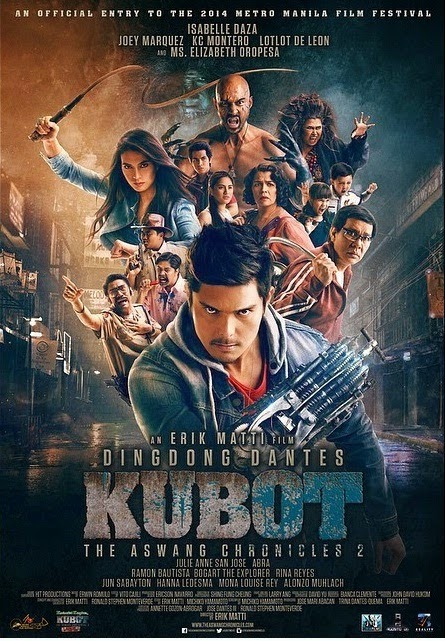 Coming from a successful movie “Tikitik: The Aswang Chronicles”, after 2 years, Dingdong Dantes will be reprising his role to its sequel “Kubot: The Aswang Chronicles”. Kubot is an official entry to the 40th Metro Manila Film Festival and will be released on the 25th of December. Joining alongside Dingdong Dantes are Joey Marquez, Isabelle Daza, Troy Montero, Ramon Bautista, Elizabeth Oropesa, Lotlot de Leon, Bogart the Explorer, Julie Anne San Jose, Abra, and Hanna Ledesma. The film is co-produced by GMA Films, Reality Entertainment, and Agostodos Pictures and is co-written and directed by Erik Matti. The movie is an all out package as they offer you an action, horror, and a comedy film. After Makoy (Dingdong Dantes) defeated packs of tiktiks and saved his wife in barrio Palupandan. Makoy and the survivors returned to manila but along the way they were ambushed by the kubots (a hairy bat-like creature) who is seeking for revenge for their husbands, the tiktiks. Sonia (Hannah Ledesma), the wife of Makoy, was killed in action and he losed his right arm. After 2 years since the tragedy Nestor (Joey Marquez), the father of Sonia, lives with the hopeless Makoy. Meanwhile the aswangs are busy saving their species and avoiding their race to be extinct. So they send the kubots to annihilate the humans. Makoy then appears to the action to rescue the human race. Will Makoy defeat the kubots? Will they win over the aswangs? Find out and catch “Kubot: The Aswang Chronicles” on December 25, 2015 on cinemas nationwide.